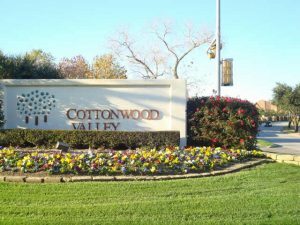 Cottonwood Valley is a residential gated community with 24 hours security and is located in the southwest portion of Las Colinas. The community has an 18 hole, par 71 golf course that measures out at approximately 7120 Yards and was updated in 2006. Cottonwood Valley Golf Course is an exclusive course for members of The Sports Club at Four Season. Residents of this community enjoy having just a short drive to get to any of the local hotspots, shopping, restaurants, Richland Community College, American Airlines Center (AAC), DFW Airport and Downtown Dallas. The neighborhood is managed by Community Management Associates (CMA) and has a large membership and board of directors. You can find more information about the schools, neighborhood and country club with the links below.